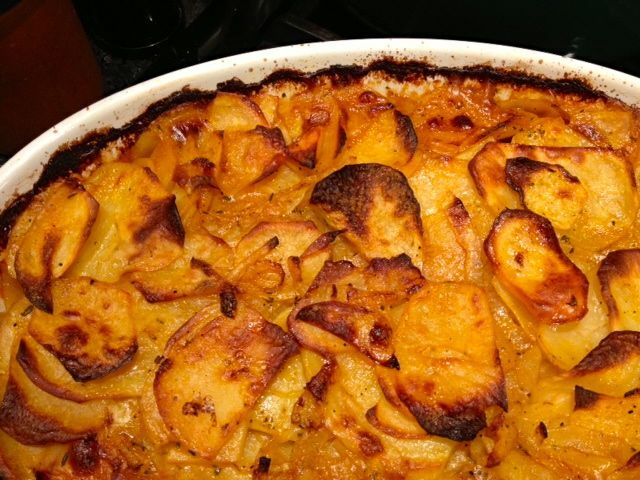 I’ve never met a potato gratin that I didn’t like, but one of my favorites is the Pommes Boulangère (loosely translated as "The Baker’s Wife’s Potatoes") that I found years ago in Patricia Wells’s great book Bistro Cooking. With stock and wine in place of the more typical cream or milk, this potato gratin is a little less rich than many versions. The last time I made this I used some smoky ham stock that was lingering from a recent stock-a-thon, and it was great, especially with a little smoked paprika added for good measure. If you’re without ham stock, go for chicken stock, which is what I’ve used for years (and stick with or ditch the smoked paprika as you see fit). With the rack in the upper-middle position, heat the oven to 425 degrees. Butter a 2-quart shallow gratin or other oven-safe casserole dish and set aside. Melt 2 Tbsp. butter in a very large nonstick skillet over medium heat. When the foaming subsides, add the leeks, 1 tsp. salt, and thyme. Stir to coat, adjust the heat to medium-low, cover, and cook, stirring occasionally, until soft, 8 to 9 minutes. Add the potatoes, wine, stock, smoked paprika, and 2½ tsp. salt and pepper to taste. Stir to mix, adjust the heat to medium-high, and bring to a simmer. Adjust the heat to medium-low, cover, and cook, stirring occasionally, until the potato slices are slightly softened and translucent, about 10 minutes. Turn the mixture into the buttered gratin dish and spread it evenly. Melt the remaining 2 Tbsp. of butter, pour it evenly over the potatoes, and bake until most of the liquid is absorbed and the potato slices on top are dark brown, about 50 minutes. Let rest for 5 minutes, then serve.